Do you know how he was elected? His fellow commissioners, all baker's dozen of them, went into a room, closed the door, and appointed him. 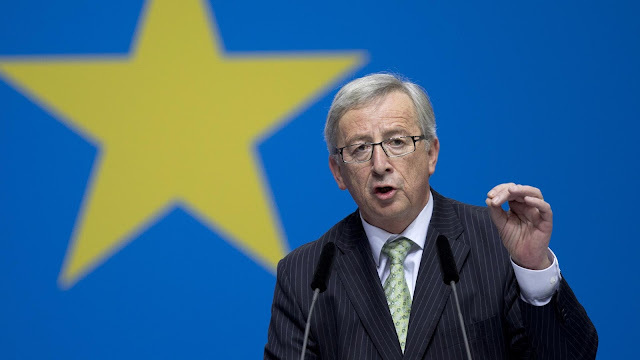 As with all European commissioners, the people didn't hire him, nor can the people fire him. Like all commissioners, he lives tax-free at public expense and enjoys an essentially unlimited expense account. The move away from Nationalism and pride in one's culture, to a European Superstate serves two purposes to which the Bureaucrats at the EU do not want to admit. 2) It allows the Bureaucrats to set themselves up as a permanent White neo-Aristocratic government, even as they import millions of pre-disenfranchised non-White citizens into Europe to replace the native Europeans. You see, without Democracy, they can do what they want. And what they want to do is import citizens who have not been acculturated in the reality of Democracy, much less educated that they have God-given inalienable Rights. Then the EU Bureaurats can become a permanent body of white Dukes and Earls and Princes who will rule eternally over the ignorant immigrants they have imported. Immigration is a Scam set up which replaces the native population in order to steal all the power and wealth which belonged to the European peoples. And these slimy pseudo-royalty are succeeding at this scam. NATO has had no viable mission since 1989. It is a Wehrmacht looking for a Wehr. That the USA has made no progress in developing a mutually beneficial relationship with post-Soviet Russia is the greatest foreign policy scandal of the last generation. Our establishment politicians have no concept of conducting peace. So there won't be peace much longer and we will all be effected. Not just the military.